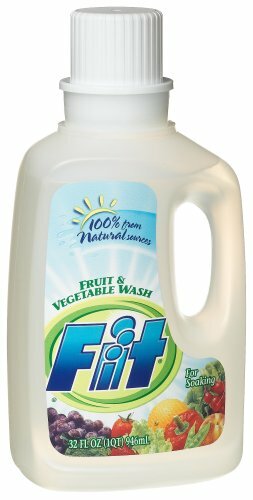 Fit Fruit & Vegetable Wash is 100% Natural and removes 98% more pesticides, waxes, people-handling residues, and other contaminants vs washing with water alone. Used Fit to clense fruit and vegetables for a long time. Always bought the spray bottle, but the bulk 32oz bottles saves money. Works Great for food, and perfect for picky pets. When I first started using Fit I was extremely impressed at how well it worked for cleaning fruits & vegetables. It didn't leave behind a bad taste, there was a noticeable improvement in how clean the food looked & tasted, and the food actually stayed fresher longer. My cat is very picky when it comes to water. After washing her bowl with very mild dish soap and rinsing it thoroughly she would still detect the smell/tast of soap and would refuse to drink from it. I spent so much time rinsing her bowl out that it was ridiculous. So when I recently purchased a Drinkwell Platinum Pet Fountain (which is great by the way) for her, the thought of cleaning and rinsing it became a nightmare. That's when I decided to give Fit a try, and wow does it work great. I can wash it, rinse it once, and my cat will drink from it without any problems. It's also nice knowing that there aren't harmful chemicals in it that I have to worry about. So to make a long story short, Fit works great for cleaning your pet's food & water bowls, especially for the ones that are picky/sensitive. One thing to keep in mind, especially for people who are in hurry, is that Fit works best when you lather it up. For example, simply spraying it on an Apple and then rinsing off probably won't do a whole lot. You need to lather it up with your hands first and then rinse it off. According to their website Fit also disinfects and kills 99.9% of harmful bacteria. The reason I mention this is because they only advertise that it removes 98% of contaminants, and I wanted to make sure it disinfected as well -- and it does. In case anyone's interested here are the ingredients they have listed on their website. I was formerly a 'just rinse it with water' kinda girl. A couple of years ago, I received a set that had a bottle of Fit with a colander. 'What kind of gift is THIS?!' I thought, but accepted it graciously as my momma always taught. Like so many gifts before, I surprisingly came around to love it. All it will take is washing a bunch of grapes, and you'll never go back. Fit removed so much more gunk than the plain water removed. Our pediatrician gave us a list of fruits and vegetables that contain the highest levels of pesticide residue, and I make sure anything on that list gets a good spray down with Fit before I feed it to my family (feel free to leave stuff as is for your mother-in-law if you have THAT sort of relationship with her! ;P ). We keep a spray bottle right next to the sink, so it's always handy. Even my little ones know to spray their apples, rub, and rinse well before they consume them.